The housekeeping crew was MAGNIFICENT. I believe the person that lead that team was Caroline. What a gem you have in her! I cannot say enough about how immaculate the home was and about their attention to detail. The few times I had a question, I called or emailed your office and had an answer within a matter of minutes! Kudos! Without a doubt, I would love to stay there again and would recommend the property to a friend without reservation. Eastern Shore Vacations continues to be the best booking experience we have. The website is incredibly user friendly. Check in and check out are the easiest of any traveling we do. And the office staff answered all of our questions instantly making booking, paying, and planning our trip pleasant and exciting. Pandion was exactly what we were looking for. The private dock was perfect for crabbing and playing with our dog all day. 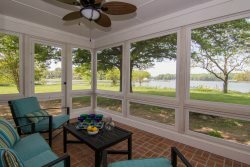 The screened in porch was the perfect place us to sit outside for morning coffee and watch the sun come up over the water. We had a lot of fun playing pool in the evening and enjoying the kayaks during the day to explore the creek. The house had the perfect amenities for my wife, dog, and I to get out of the city and enjoy the best of what Maryland has to offer... the Chesapeake Bay! And of course with only being a few miles from St. Michaels we were able to leisurely ride our bikes into town for meals, drive in for shopping, and head down to Tilghman Island. Pandion was such a great house for the week and we are looking forward to coming back next summer. We enjoyed our stay very much. Easton is a wonderful town. Great restaurants and fun shopping. One more positive note this home is dog friendly. We love this house. Would like to stay for two weeks instead of just one, but it's too expensive. If there was a deal for a two week continuous stay, we would probably do it.